A very popular snack, our Bhujia Namkeen is made using the finest quality ingredients. 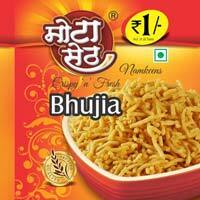 We are an established Manufacturer and Supplier of Bhujia Namkeen. Our Namkken is prepared and packaged in neat and hygienic conditions using advanced technology. We have all the in-house facilities to deliver bulk orders of the Namkeenn within the promised timeframe. One can obtain the Namkeen at competitive rates from us.